The experience of our present day city in every day life is increasingly a hybrid one – meaning that it is made up of both physical and mediated experiences that mutually influence, extend or contradict each other. At the same time, the design of our cities is for the most part still a rather stratified process where different disciplines shape the different ‘layers’ of the urban experience. Planners and architects are still mostly interested in the physical, spatial design of cities. Whereas it is artists, telecom-operators, activists, and dotcom-start-ups that shape the software and interface layers through which the experience of a physical place is optimized, extended, reframed, negated, denied, contested or contradicted. What is more, these different disciplines all have their own traditions of understanding what a city is or should do. Often they don’t even understand each other’s language. This is of course not necessarily a bad thing. Cities have always been heterogeneous or hybrid spaces where different logics are at work – and in competition with each other. Urban culture has always been a negotiation between the spatial embodied ideals of architects and the messy practices of everyday life. At the same time we think that this time around this negotiation is becoming more complicated. It is not just the architect or planner that sets the stage for our urban experiences. Digital media, software and embedded technologies – varying from location based services to ‘smart’ sensors – play a co-constituting role in setting and sorting the stage as well as in both enabling and regulating public interaction. While trying to get a grasp on the different ways that digital media technologies are shaping our cities and could be incorporated in the design process, we came up with a number of possible ‘design approaches’. They form a somewhat ad lib constituted list of categories, each made up of different elements that together set the boundaries for the design process. These design approaches combine certain design tools, a methodology, a particular way of understanding what a city is (often embedded in one or another discipline) and/ or particular urban ideals. A design approach thus consists of a particular way of understanding the world, and / or a particular methodology, tools and objectives to intervene in that world. These design approaches are not neatly comparable variables: in one approach the tools might be decisive, another departs from social processes, a third from technologies and a fourth stresses a particular urban ideal. Some operate at the scale of urban planning, others mostly focus at hyperlocal interventions. Some of these approaches are overlapping, others might be combined. This list is also not exhaustive – please feel free to add any approaches that we might have overlooked. Yet we do think that it gives a sense of all the different concurrent and sometimes competing approaches at work in the 21st century hybrid city. · The Wiki-City – Designing with new media – How can the design process itself be restructured through the use of (social) digital media? How can one allow for more participation, bottom-up input, and engagement in a productive way? How does this change the relation between client, architects and other performers, and the audience? · The Real Time City – Data-aggregation in the Design Process With the rise of digital and mobile media and gps receivers, urbanites have started leaving numerous digital traces behind that when aggregated reveal their usage patterns of the city. What exactly do we learn from these datasets, and how can they be incorporated in the design process? · The Living City – Urban experience, narratives and design Digital media can be used to annotate urban spaces with people’s everyday stories and lived experiences. How does this temporal inscription of place change they way we see and interact with the urban environment? · The Multimedia City – The design of urban screens and media facades Architecture is increasingly using multimedia components as part of their elementary set of building blocks. How can you incorporate these into urban design? · The Augmented City – The design of informational services in a physical context In augmented reality, additional layers of information are projected on or over physical environments. Thus the domain of digital information is embedded in the physical domain. What is the potential for urban design? 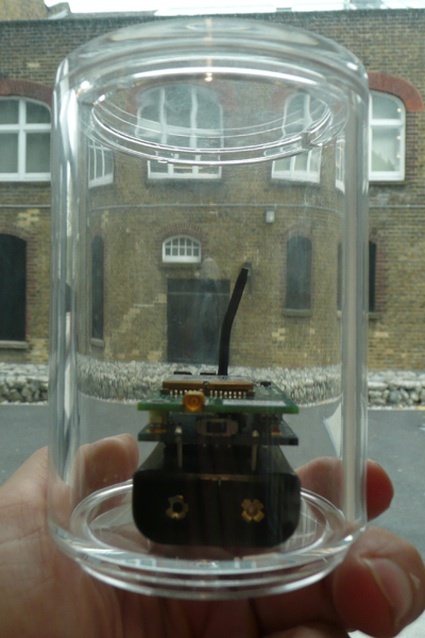 · The Sentient City – Designing Responsive Architecture Various sensors can register real-time information about the environment, and movements, (social) processes and identities of people and objects. Technical systems may also respond to changing conditions. How can this be employed to adapt the shape, function, usage of or access to buildings and infrastructures? · The Smart City – Using artificial intelligence to design urban systems that respond or anticipate what is happening Can AI be integrated in urban design to anticipate and respond to urban patterns? · The Hybrid City – Designing for hybrid practices. Digital and mobile media have led to changing urban behaviors and the rise of new cultural practices. For instance, the advent of WiFi has increased ‘mobile work’ from (semi-)public spaces. How can these changes in cultural practices be translated back into design, either by physically accommodating them or by design interventions that discourage them? · The Layered City – Integrated design of the parallel experiences of physical places and mediascapes If the experience of the city is shaped by both the shape of the physical city as well as through exchanges in the media landscape, can we design both layers (or ‘channels’) of an urban project in concordance with each other? · The Plugin City – using digital media to optimize, personalize or extend the experience of the city Can digital media be designed as ‘plug ins’ to the existing city, make the usage of existing urban structures more efficient and personalized or extend and deepen their experience? · The Tactical City – using digital media to design alternative usage of the city Can digital media be designed to open up the design of physical spaces to other users or practices than initially intended? · The Critical City – using design to foreground and discuss the dominant discours on urban culture Can design be employed as a means to a debate on urban culture, rather than shaping urban culture itself? 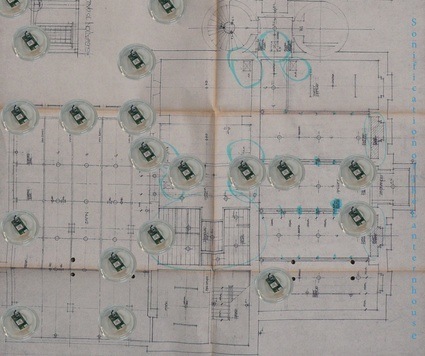 · The Interface City – designing urban ‘interfaces’. Some urban theories understand the city itself as an information platform where goods, opinions and ideas are constantly exchanged. Can new services be designed that optimize or extend this function of the city as a platform of exchange into the digital domain? · The Informational City – The design of information spaces In our understanding of the media world spatial metaphors play an important role. Some architects have made the leap from designing physical structures to using their spatial expertise in ‘information architecture’. To follow the previous post, a list of mashup terms linking digital media and architecture/urbanism. The list seems quite complete and interesting, even so I believe it should hybrid itself with less media centered approaches (i.e. the previous post...). ElectroSmog is a new festival that revolves around the concept Sustainable Immobility. The festival will introduce and explore this concept in theory and practice. With Sustainable Immobility we refer to a critique of current systems of hyper mobility of people and products in travel and transport, and their ecological unsustainability. The exploration of Sustainable Immobility is a quest for a more sustainable life style, which is less determined by speed and constant mobility. A lifestyle that celebrates stronger links to local cultures, while at the same time deepening our connections to others across any geographical divide, using new communication technologies instead of physical travel . What we propose may sound a bit like a paradox: The proposition of the festival is that the unfolding crisis of mobility can only be effectively addressed by deepening our connections across geographical divides through new communication technologies. The festival wants to engage the fundamental promise of the information age that communication technologies can replace the need for physical mobility, and thus both contribute to ecological stability as well as a more rewarding both deep-local and translocal life-style. While this promise has existed since the dawn of the information age, it was never realised. New material realties, however, force us to critically re-examine these promises and seriously start to turn them into viable choices. Nothing is self-evident for us. We will also critically question the underlying premise that reliance on electronic connections and local roots is self-evidently more energy efficient and more ecologically sustainable than current systems of globalised mobility of people and goods. Is ‘going local’ the only solution? What are the true energy costs and environmental and health hazards of using even more electronic technologies (increased levels of electrosmog)? How can remote connections become a truly rewarding experience in and of themselves? We believe that only by answering such questions a viable alternative to the current unsustainable systems of hyper-mobility can be found. The ElectroSmog festival brings together a broad coalition of designers, environmentalists, urban and spatial planners, technologists, artists, theorists, and engaged and concerned citizens, to explore and ‘design’ sustainable immobility. The festival stakes its claim for a radical break with the current systems of hyper-mobility not simply by discussing the issue, but by actually implementing it. To achieve this the very concept of an international festival and its traditional conventions need to be rethought and redesigned from the ground up. ElectroSmog is a truly international festival, with everything you might expect of such a festival: international debates and discussions, performances, art projects, exhibits, site specific projects, screenings, design competitions, and much more. However, no presenter will travel beyond their local or regional boundaries to participate in this event. To achieve this we will work together in a network of accomplished cultural and new media centres, labs, theatres and other public venues to create the local ‘hubs’ that will inter-connect for this unique festival. A crucial dimension of the festival will be its on-line presence, where audiences from basically anywhere with an internet connection can follow events on-line, join in discussions and debates, and contribute to the program. ElectroSmog acknowledges from the start that bandwidth is not equally distributed across and within societies. Therefore remote connection to lower bandwidth spaces, do-it-yourself telematics, and information technologies for the majority world will be one the central concerns the festival wishes to address, again both in theory and in practice. • ElectroSmog is Good for You! Around the main program a host of satellite events is organised locally and translocally. • Art projects and local interventions, including original works by Bureau des Etudes, Karen Lancel & Hermen Maat, John Cohns, Sean Kerr, Kevin McCourt & Bartolo Luque, and others. • Special events, screenings, book launches, and more. • On-line projects and environments designed specifically for the festival. I re-publish this announcement just to underline the term "sustainable immobility", the very interesting related questions and the growing trend about moving less (people and goods), while mainly replacing/substituting physical mobility by digital communication (mediated mobility, so to say). I don't agree on everathing that is written here but it's definitely worth thinking hard about it! Questions are interesting. How to mitigate mobility by communication and a sort of "hyper localness"? My research directions would be "sustainable globalization", "sustainable mobility", "spaces interferences" or "spaces creolisations", "hyper vernacular" and "hyper localness" as well as "mediated mobility"! 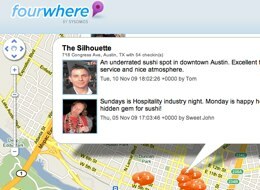 New location-based social search tool FourWhere shows Foursquare tips and comments using Google Maps so you can search and discover what everyone is saying about nearby places. Users simply input a location or address into FourWhere, right-click (control click) on the map and select display preferences. 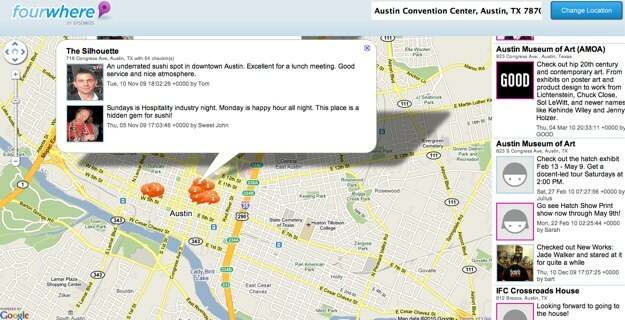 The map can display all comments nearby, all venues in the vicinity and/or remove venues without tips. It’s a simple app with a powerful purpose. For those of us preparing to journey out to Austin for SXSW, FourWhere’s release couldn’t have come at a better time. A search around the downtown area yields comments with insightful information about restaurants and bars. Essentially the application offers a map-based search experience for socialites looking to plan a fun night out. FourWhere currently only pulls in data from Foursquare, but Sysomos, the company behind the app, has plans to integrate more social data in the future. A few weeks ago, and against my better judgment, i stopped by Decode: Digital Design Sensations at the Victoria and Albert in London. The exhibition showcases recent developments in digital and interactive design through three themes: Code, Interactivity and Network. I have nothing particularly flattering to write about the exhibition. 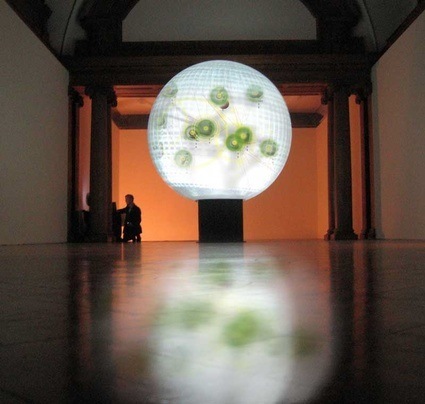 I wish i had done like Furtherfield and visited the Digital Pioneers exhibition instead. The exhibition takes place at the V&A as well but doesn't benefit from as much advertising as Decode. In theory, Decode looks like a very glam affair. In reality, it has a bit of a fancy thrift shop feeling with all the works crammed in a confined and confused space. I was left in shock when i saw how little space each work had to breathe while all around me a group of school girls were laughing their way from one work to another, frantically waving their arms/head/some bathroom appliances in all directions in order to trigger some kind of reaction... sorry "interaction" from the works. The code section of the show wasn't a much more pleasant experience. I had to fight my way through a narrow corridor jam packed with people taking pictures or videos of the strikingly beautiful works on screen. I'm glad the exhibition is such a success. I'd even go as far as confessing that i'm perversely happy that interaction and digital design are being thrown in the direction of the broad public in such an informal way. Damn! it's not like me to bad-blog an exhibition like that. Maybe i was not the right audience for that kind of exhibition but then maybe i am because some artists whose work i admire are participating to the show. Stanza is one of them. As his bio says, Stanza is an expert in arts technology, CCTV, online networks, touch screens, environmental sensors, and interactive artworks. Recurring themes throughout his career include, the urban landscape, surveillance culture and alienation in the city. The Decode exhibition wasn't that bad. After all, it gave me an excuse as good as any other to blog this little interview with Stanza about his work. How visible are the sensors in the city? Actually I don't advertise where they are exactly, they are too expensive to loose. The visability is virtual and presented via its GPS location. All the data is presented online via XML feeds that are open source. Do you have to keep them hidden lest they get stolen or damaged? How do you select the location of the sensors? Do you need a special authorization to place the sensors and collect the data? In theory yes, in practice, I don't. There are more complex issues about security of space and surveillance. In fact because of the potential of this project for larger scale urban monitoring, noise and pollution monitoring in real time I am surprised I haven't been approached to develop this on a larger scale. By measuring all sorts of physical data the sensors reveal also some social aspects and variables of the environment. The text that presents Sensity states that "The output from the sensors display the "emotional" state of the city". So what is the emotional state of the city? The condition of change of time represents the emotional state as measured by the varying sensors. Do you perceive patterns according to the time of the day for example? The patterns and shapes in the visualisation are what is being affected by the real time environmental conditions. Well the time of day affects the patterns that are relayed to the screen. 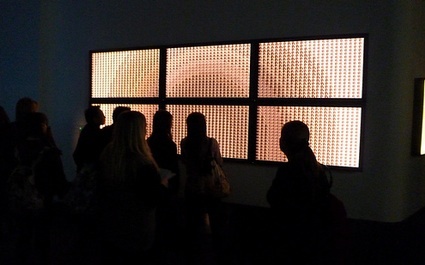 What can the 'general public learn from Sensity? I want the public to explore new ways of thinking about interaction within public space and how this affects the socialization of space. The project uses environmental monitoring technologies and security based technologies, to question audiences experiences of the event and space and gather data inside the space. The project also focuses on the micro-incidents of change, the vibrations and sounds of the using these wireless sensor based technologies. Imagine walking out the door, and knowing every single action, movement, sound, micro movement, pulse, and thread of information is being tracked, monitored, stored, analyzed, interpreted, and logged. The world we will live in seems to be a much bigger brother than the Orwellian vision, its the mother of big brother. Can we use new technologies to imagine a world where we are liberated and empowered, where finally all of the technology becomes more than gimmick and starts to actually work for us or are these technologies going to control up, separate us, divide us, create more borders. With the securitzation of city space create digital borders that monitor our movement and charge us for our own micro movements inside the system. The data is also used to create visualizations in an open source environment. Other online users can also re- interpret the data and interrogate the various sensors in the network as this is open sourced as well (xml streams). What I have learnt from mixing the cities and creating mash-ups online with the data from various city set is that there is a new space, a 4^th space, a new world of possibilities. These works are focused on the wider picture of city experiences which are being played out in real time. This sort of experience of multi nodes and multi threaded spaces, demands a refined gathering of data, a sensitive accumulation which can then lead to some kind of modeling and visualization. [audible and visual (mils)-representation] of the social network as it exists and is impacted upon. Do you navigate cities differently after you have submitted them to Sensity? Within this project no.....and it's a good question. However within a project like soundcities.com the experience and the relationship to place is different. 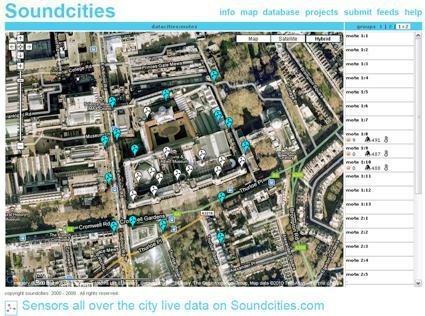 Soundcities is my online open source database of city sounds from around the world, that can be listened to, used in performances on laptops, or played on mobiles via wireless networks. The project soundcities is completely made up of found sounds and soundscapes from the thousands of samples I collected. The sounds of cities also give clues to the emotional and responsive way we interact with our cities. Cities all have specific identities, and found sound can give us clues to the people that inhabit these spaces, as well as provoking us and stimulating our senses in a musical way. Within soundcities the aim is to create an online aural experience that evokes place, both as literal description but also developed musical composition. The sounds of cities evoke memories. So this idea of assent gathering of sounds creates a different feeling that the gathering of data. With sensity although we are the body in the data space; we again control it but because its on a micro scale it's harder to relate to. That's why a project like Sensity is so important. The way Sensity is exhibited can be scaled up and this depends really on the commitment of the host organization. I now have several version of this artwork. A local version can be made and then projected and also shown online. I have already made versions for several cities. In this case I test and deploy my sensors and make the visualisation. Making it real time so sensor data isn't recorded but real time. This involves set up of technology, adding some code to router, using my sensors, using my computers, set up of the sensors in the correct location, programming them, replacing batteries and care for the duration of the show and insurance. In this case I test and deploy my sensors and make the visualisation and leave the sensors and the computers running all the time. How it looks in the gallery or the actual displays ie, what it is seen by the audience. It can be experienced on plasma screens, projected or shown on 3d globes. Once the visualisation is made there are a numbers of ways to present it. The Decode show is a much longer term real time colloborative deployment of my two networks in the gallery and across the city. I can monitor all the sensors remotely tell the gallery to change batteries, etc. The issue is that the V & A and their technical team has to be able to support the technical needs of the work. What becomes of the data once the show is over? None of the data as the system is set up is archived.... it's all real time. I do plan to allow the database to have a history but this now requires further funding and development. Pictures i took in the Decode exhibition. Decode: Digital Design Sensations continues until the 11 April 2010 at the Victoria & Albert Museum in London. I somehow have the same remarks as Régine Debatty about the V&A Museum's show, but I also believe it's an important shift nonetheless (so as the recent Design & the Elastic Mind at the MOMA NY) as Digital art & design comes out of the box into mainstream museum. The time of specialized shows and "ghetto exhibitions" is getting to an end. Which also means that discourses will change to more general art and/or design questions and will be less and less focused on the media, or how you use the media, etc. This is over for a while anyway. The work of Stanza is now one among many that treats the questions of environmental capture in the city or architecture. I think there a lot to do out of this "environmental capture". Variable architectures and environments or nomadic way to inhabit hyper vernacular and sustainable structures? 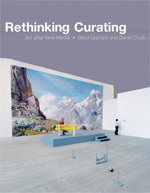 Colleagues and friends Sarah Cook and Beryl Graham have just published Rethinking Curating: Art After New Media. I had the privilege of writing the Foreword for the book, and this is, in part, how I discuss their thesis. It is perhaps wishful thinking that this book will end the eternal recurrence of the same set of questions about what is new media, but it is a huge step forward. Buy it. Read it. Enjoy it. Ask some new and different questions. Following an earlier post about the same book, some short developments here by Steve Dietz.